"95 seconds in Empire, 34 seconds in Jedi, and blink-and-you'll-miss-him cameo in the original [special edition] film," noted the San Francisco Chronicle cover story that featured The Boba Fett Fan Club. As many of you know, Boba Fett began as more than a character. He was a figure--an original figure--sought after as an elusive and controvertial mail-away "rocket firing" Boba Fett before Empire introduced him. Then he's here and there, sold and re-sold all year-round. I'm facinated by that, as how he's over-exposed in this area. I think there's plenty of room to discuss this, especially as BobaFett.com's Bounty section improves with a mid-2006 scheduled re-launch. What is your favorite Boba Fett collectible? It can be something you own, or that you admire. Feel free to browse the listing. Thanks Admin, My favorite Boba Fett collectible is the Die Cast 6" Boba Fett Figure that i keep on my desk to look at and goof around with at all times. Its one of my little tributes to him. I would like one of those....the unleashed figure....of boba. I haven't seen one in a looooooong time. i'll have 2 check the i-net. They're totally durable, as well. I have noticed that too....i've never had a cheap plastic hasbro toy....ever. But the Bib Fortuna gives me nightmares!! I would kill for the original Boba kenner action figure. I must say I'm more into the artwork. I've got an autographed print of Tony Bela's (also autography by Jeremy) and I love it! I like the remake of the twelve inches Boba Fett figure, which I own. I'd say thee Bobble head released by Starwars.com, by far the best! hmm i have a really old Slave l that came with Boba Fett and Han Solo in Carbonite. does anyone have the boba fett from the droids series that was produced by Kenner toys in canada? I have a toy Jango fett blaster. The only thing I've got is a Boba Fett statue. I used to be obsessed as a kid and he's still my favorite star wars character. The statue is on a stand which is about half an inch high and the figure is about six inches tall. Printed underneath the stand is "1998 Lucasfilm Hasbro Made in China". The weird thing is that the stand says "Darth Vader" instead of "Boba Fett". I was pretty young when I got it and I was kinda angry that the manufacturer messed up but then I realized I had a pretty unique statue on my hands. Has anybody ever heard of this defect before? 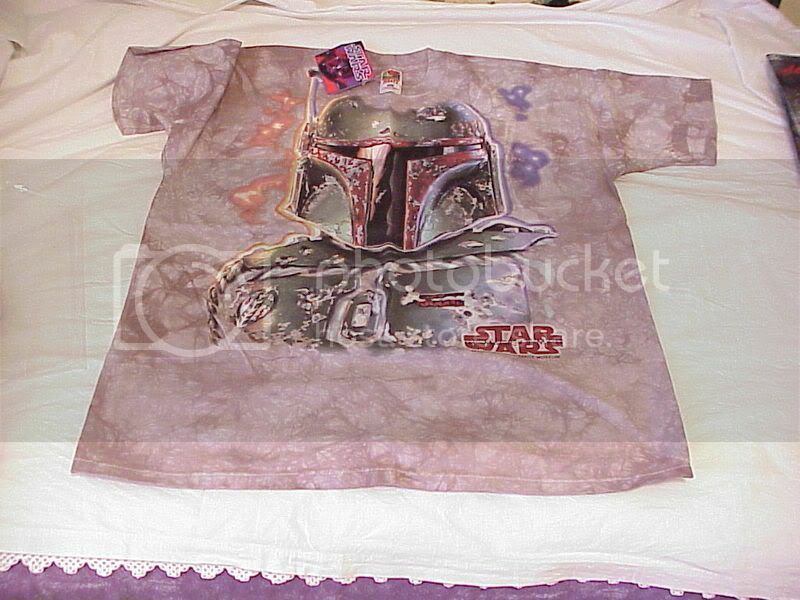 Oh yeah I also have a really cool Boba T-shirt. I think it might be a unique piece too. It's a grey tye-dye shirt and it has Boba's head and shoulders painted on it. I'm pretty sure it's airbrushed and not any kind of official merchandise. The combination of the gnarly armour on a funky grey background makes the image so diffuse that most people have no idea what they're looking at. To most people it looks like a weird landscape or something completely abstract unless I tell them what it is or if they have some idea of who he is. Yet the image is correct in that he is accurately represented; nothing is out of proportion and the colors are all perfect. I'd be really interest to see the shirt. If you could get a picture up here that would be cool. Is this what it looks like or is it more bright in background colors? Man i need to dig out my shirts...I'm pretty sure I've got that one, my fav shirt though is my "Got Armor?" shirt. Got it on eBay a while ago. I think my fav item right now though is my new flash drive. It's #727/5000. I think it's hilarious that it's numbered. so does that mean they made 5000 Fett flash drives? Or 5000 4g Fett flash drives? sorry the pic is blurry, I'll try and get a better one.